CBRE has announced plans to relocate its North Sydney office to 177 Pacific Highway – continuing a global roll out of new workplaces designed around wellness, flexibility and activity based working. 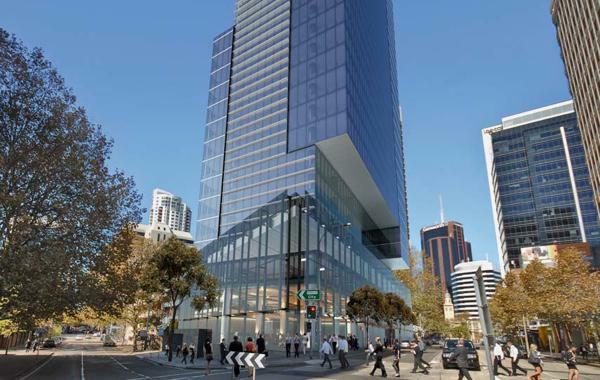 To initiate the move, CBRE has leased level 29 at 177 Pacific Highway – North Sydney’s newest office tower, due for completion in August. The deal delivers CBRE 1,498sqm of space on a seven-year lease term. It is the latest commitment for the 40,000sqm building, which is being developed by CIMIC Group through Leighton Properties on behalf of Suntec Real Estate Investment Trust (Suntec REIT). CBRE joins a high profile roster of tenants readying to relocate to the building, alongside the likes of Jacobs and Vodafone. CBRE’s North Sydney Managing Director Ryan Johnson said the move would cater for the significant growth that had occurred in the firm’s north shore business, which now comprises 145 commercial and residential staff. “Our aim is to create a world class environment for our clients and staff that is energised and highly collaborative and where our clients could generate maximum advantage,” Mr Johnson said. CBRE has engaged international design firm Gensler to create the concept plans – drawing on its experience in designing a range of CBRE offices globally under a model known as Workplace 360l. Gensler will team with CBRE’s Workplace Strategy, Project Management and Sustainability division to deliver the new workspace and achieve a WELL rating. The move will bring together CBRE’s North Sydney commercial business and its highly successful Residential Projects team, which have previously been housed in separate, neighbouring offices. The move to 177 Pacific Highway has been initiated following the firm’s successful shift to an Activity Based Working model in the CBDs of Sydney and Melbourne and in two of its smaller satellite offices at South Sydney and South East Melbourne.